Gaudi planned and directed the construction of the park in Barcelona from 1900 to 1914 for Count Eusebio Güell. The park was originally part of a commercially unsuccessful housing site. Only three lots were sold: two for the home of Trias family, and other that Gaudí purchase for imself in 1906, and now it is a museum dedicated to Gaudi. This park is a place of great plastic beauty. A grand stairway divided by a mythological dragon or lizard leads to the large hypostyle hall. This is built with 84 inclined columns. These in turn support the great upper plaza, a fine balcony over-looking the city and the sea. The large plaza is delimited by an extraordinary balustrade-bench which twists in serpentine manner to form winding course, recesses and small semi-enclosed areas where the facing of brightly colored ceramics creates a spectacular collage which seems to have anticipated a vein explored later avant-garde artists. 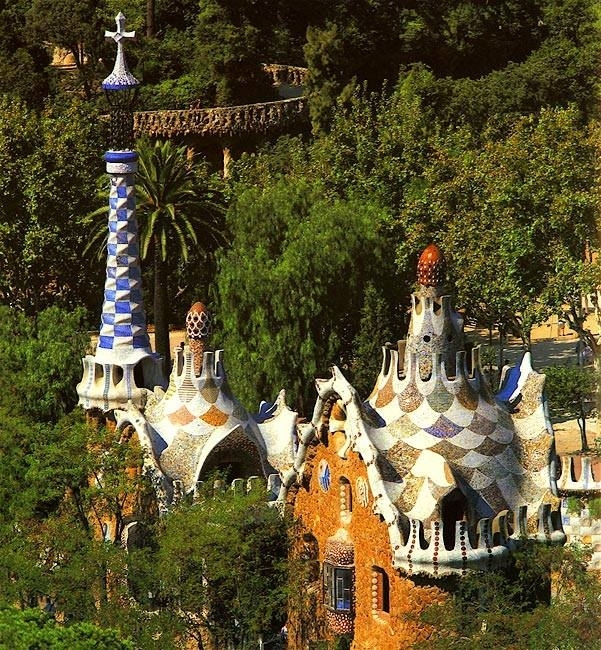 UNESCO declared Güell Park a place of World Heritage in 1984.